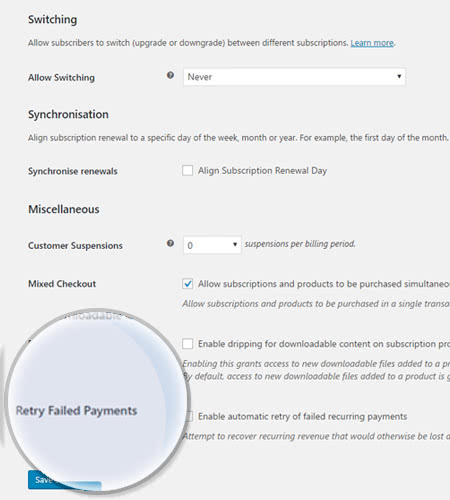 Sell products and services with recurring payments in your WooCommerce Store. WooCommerce Subscriptions Plugin allows you to introduce a variety of subscriptions for physical or virtual products and services. 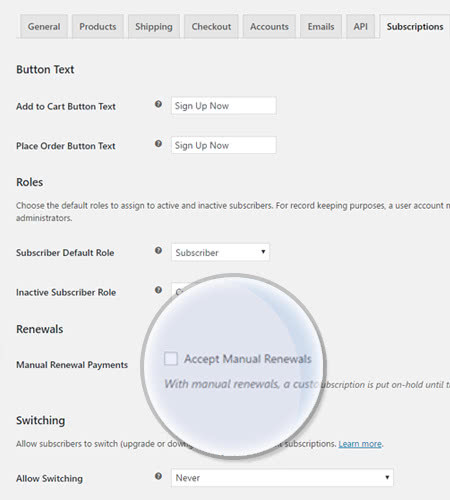 Moreover, the subscription coupons make it easy to create and manage products with recurring payments. First thing to remember is that all your clients will have the option to upgrade or downgrade their personal plan, without needing you for this. One of the perks is that the subscription-based model will let you capture more residual revenue. For this, all you have to do is ship all the purchases. 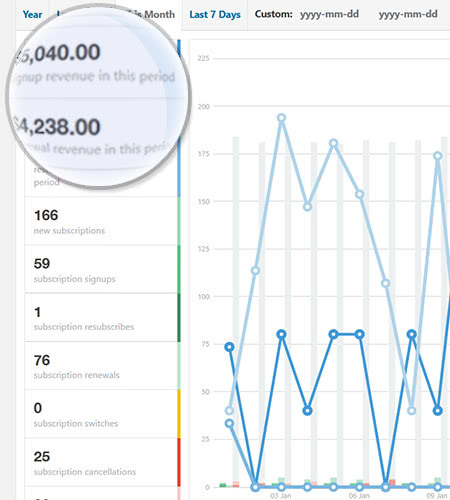 This feature displays the events in your subscriptions over a predefined period of time. Keep track of your subcribers or revenue! You can still recover your money even when a payment is declined. Either turn on automatic recurring payments or do it manually. You can easily use the Renewals Feature if you have regular payments. The process includes generating an order and notification via email. 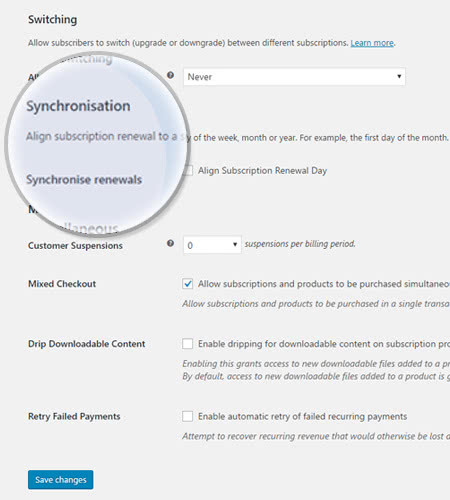 Synchronise all your customers subscriptions based on a schedule that works for you. You can choose a day for each product. 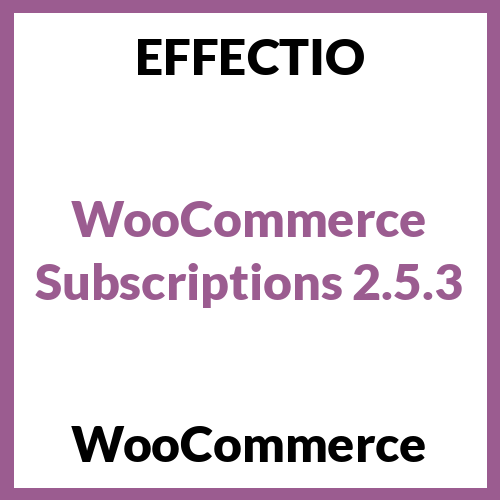 Why Use EffectIO’s Deal on WooCommerce Subscriptions Plugin? Firstly, you have multiple billing schedules available to suit your needs. Secondly, you can make convenient automatic payments with over 25 payment gateways. Thirdly, it supports manual renewal payments through any payment gateway. Not to mention that it goes along with automatic email invoices and receipts. In addition, it delights customers by offering subscribers special discounts on their payments or sign-up fee. It is using a subscriptions coupon such as a recurring discount. More than this, this plugin gives subscribers the ability to manage their own plan, including upgrading or downgrading, without needing to wait on you for help. Also, it offers free trials to increase trust and boost conversion rates. Last but not least, it has built-in renewal notifications. Those notifications will let you and your customers know when subscription payments have been processed thus preventing any surprises. Offer your customers the best security for recurring payments. Give your customers different alternatives by providing more than one payment provider. Boost your conversion rates by offering free trials. Doing so you will win more trust from your customers. Your subscribers will be thrilled if they receive special discounts at sign-up or when they are making payments. It makes it easy to create and manage products with recurring payments. Best plugin for creating and managing products!! This is what you definitely need!!! MUST have product from Effectio!!! I am looking for a plugin that will allow access to a members-only page via PayPal recurring payments, will this do the trick? I am using woo commerce on two websites with divi. So I will need to use this on two websites.